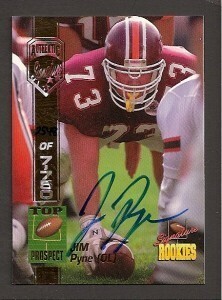 1994 Signature Rookies certified autograph card of former Virginia Tech superstar offensive lineman Jim Pyne (his #73 was retired by the Hokies), who later played in the NFL for the Buccaneers, Lions, Browns and Eagles. Numbered out of 7750 produced. ONLY ONE AVAILABLE FOR SALE.